Pro actively preparing for breast cancer surgery by performing breast cancer exercises improves patient morale and helps to relieve anxiety, tension, and stress. It boosts the patient's circulatory systems and increases their overall physical conditioning. The more fit the patient is before surgery the better the odds of becoming a successful breast cancer survivor. Performing exercises for breast cancer before breast cancer surgery develops definition between internal anatomical structures (tendons, ligaments, muscles, lymph nodes, & etc.). This helps the surgeon in separating and identifying what needs to be removed and what doesn't. Again, the more physically fit and mentally positive the patient is before breast cancer surgery the more quickly their breast cancer recovery progresses. Andrea Leonard, Cancer Exercise Specialist, is Devoted to Assisting Breast Cancer Survivors Rehabilitate. Founder and president of the Breast Cancer Survivors Foundation and The Cancer Exercise Training Institute. Author of the Cancer Exercise Specialist Handbook and co-author of the book, Essential Exercises for Breast Cancer Survivors. Certified by the American Council on Exercise, the American College of Sports Medicine, and the Cooper Institute as a personal trainer and special population’s expert. Adjunct faculty member of The American Council on Exercise and the National Academy of Sports Medicine. Conducts national workshops on Cancer and Exercise and administers Cancer Exercise Specialist Examinations and renewals for Certified Cancer Exercise Specialists. Andrea, a cancer survivor herself, is the owner and founder of Leading Edge Fitness based in Portland, Oregon. Her passion is to educate and inform the public concerning breast cancer surgery and she is qualified to speak to groups of all sizes about this and various other fitness topics. Breast cancer rehabilitation begins before breast cancer surgery with exercises for breast cancer. After breast cancer surgery upper body muscles and their attachments (tendons and ligaments) need to be carefully lengthened and strengthened. Equipment using springs or rubber bands produce increased resistance the more they are deformed. This creates uneven strengthening through the range of motion (ROM) performed. And if the resistance is increased too much it may cause damage by "overloading and blowing out" what has been surgically attached. HeartFlex uses a patented passive resistance assembly to create "consistent resistance" across the complete range of motion (ROM) performed. This builds muscular strength over the entire movement. Since its resistance is consistent it lessens the chance of "overloading" sensitive healing structures during breast cancer rehabilitation. Flexibility is quickly increased because patients are in control of their own joint manipulation. We have teamed up with Andrea Leonard to create an effective and affordable at home breast cancer recovery video. It makes a truly thoughtful, loving, and practical breast cancer gift for people about to undergo breast cancer surgery. Each package contains a HeartFlex exercise tool and a DVD with Andrea Leonard's video demonstrating exercises for breast cancer. A breast cancer gift specifically designed for breast cancer patients by Andrea Bruno, the nation's foremost authority on breast cancer fitness and breast cancer exercises. Andrea's breast cancer fitness DVD; (level 1) for those just out of surgery and (level 2) for those wanting more of a challenge (50 minutes in length). As a bonus Andrea has included a segment on how to recognize the warning signs of lymphedema. 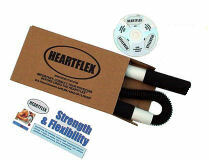 HeartFlex General Instructional DVD illustrating35 HeartFlex movements along with care instructions. to undergo breast cancer surgery and breast cancer recovery. The breast cancer exercises demonstrated on this video improve breast cancer fitness by concurrently improving upper body musculature and definition along with stimulating the circulatory, pulmonary, and lymphatic systems. "This at-home Breast Cancer Exercise Combo (DVD plus HeartFlex exerciser) assists breast cancer patients and breast cancer survivors prepare for, and speed recovery from, breast cancer surgery. " Andrea, a cancer survivor herself, is the owner and founder of Leading Edge Fitness, based in Portland, Oregon. Her passion is to educate and inform the public concerning breast cancer surgery and she is qualified to speak to groups of all sizes about this and various other fitness topics.